Nothing But Creative: Now customize your Flip Mino for Free. Yay! Now customize your Flip Mino for Free. Yay! 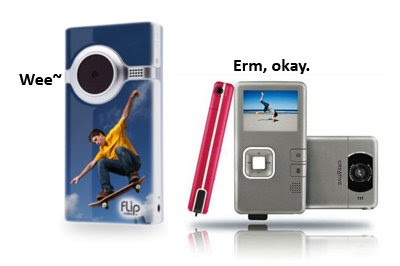 As the story goes, the Flip Mino is Creative Vado's closest competitor in the Pocket Cam Corder market. However close it was, the Vado is still lighter, smaller, cheaper and better looking than the Flip (read article here). Now, the Flip is teaming up with CafePress to offer its customer "Next-Generation Personalization For Consumer Electronics" absolutely free. I don't know why the term "Next-Generation" is used here because pasting stickers on a gadget is very much a This-Generation technology to me. And yes, who's willing to buy your secondhand Flip when you decide to sell it on eBay? Having said that, I might be forced to eat up my words if Creative eventually decide to follow suit and offer its own customization (Creative, please don't) but I have faith it won't. The Creative Vado is now $20 cheaper in Singapore ($149), so if you haven't get yours, now is the best time to! Update: The GigaWorks T20 and T40 series II is now available at Creative's Singapore online store @ the price of $179 and $269 respectively. Buy now and receive a FREE 1GB ZEN Stone (refurbished).